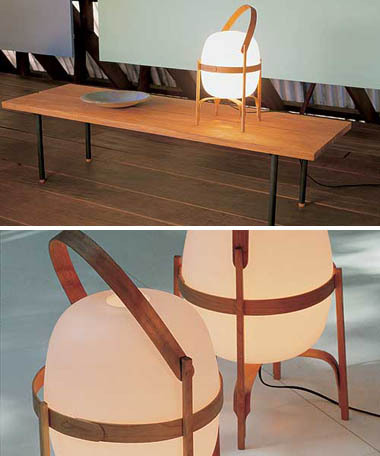 Santa & Cole: Miguel Mila: Cesta Table Lamp, imported from Europe. The Cesta, a magic lantern created by well-known designer Miguel Mila, consists of a cherry wood structure and an inner ball of light. Its oval volume and handle make it equally ideal for table tops and the floor. In the mid-sixties, the Cesta's supporting structure was made of Manila cane and the ball of light was made of plastic. Santa & Cole dignified and updated it after 1996, using heat-curved cherry wood and an opal crystal ball which enclosed the bulb, and adding a dimmer which allowed adjustment of light intensity. It is a lamp with a sense of nostalgia, which is proving even more attractive for the newer generations. It is reminiscent of the style of lantern which hung on coastal houses as a signal for the returning sailors, and which was also found in country houses and terraces open to the dark nights of 1970s Spain. Today, it is a classic lantern found in houses with a wide range of dZcors, and bears the characteristic stamp of its designer Miguel Mila. Like a Chinese lantern or portable torch, it would not be out of place in the Japanese palaces of the Edo period, with its careful modulation of light and shadow. The attention to detail is reflected in the fact that not a single screw is visible, and that a wooden pin enables the handle to be turned and prevents it escaping from its guide, with the result that all the materials employed for the mechanism are wood.